Hurricanes, volcanoes, droughts, floods, fires, tsunamis: Satellites capture some of Earth’s most destructive forces. Earth-orbiting satellites can inspire awe of the beauty of our planet and provide breathtaking vantage points from which scientists can study its complicated dynamics. Satellites are cataloging Earth’s changing ice coverage, measuring water content inside leaves, monitoring air pollution, and tracking illegal fishing operations to protect marine ecosystems. These satellites are also a key resource for people who study natural disasters and those who respond to them. Governments and disaster relief agencies use satellite images and data to pinpoint areas that are at risk, track the progress of ongoing disasters, and monitor the impact on affected regions. Scientists use these data to study rare phenomena caused by intense conditions, refine models to predict future events, and inform policies that seek to minimize damage and save lives. These six images of recent natural disasters, all taken by Earth-orbiting satellites, demonstrate our planet’s raw power and show how satellite images and data can detect and monitor catastrophes around the world. A series of strong hurricanes from the Atlantic Ocean battered the eastern coast of the United States last year. Hurricane Florence, seen in the image above, was among the strongest to make landfall in the United States in 2018. Cameras attached to the International Space Station captured this image on 12 September 2018, three days before Florence struck North Carolina and South Carolina. Satellites tracked this storm as it developed. While over the Atlantic, Florence grew to be a category 4 event, with an estimated maximum wind speed of 225 kilometers per hour. Although it weakened to a category 1 hurricane before landfall, Florence dropped 76 centimeters of rainfall in some areas and produced storm surges of up to 4 meters. Florence claimed more than 50 lives and is estimated to have caused up to $50 billion in damage from windswept debris, storm surge, and flooding. Kīlauea, a volcano on the island of Hawai‘i, cracked open on 3 May 2018 and began spilling lava through neighborhoods and toward the ocean. The initial eruption from a fissure was immediately followed by an M6.9 earthquake and hundreds of smaller quakes, 23 more eruptive fissures, molten fountains 70 meters high, ash plumes reaching 9.1 kilometers into the atmosphere, and dangerous levels of sulfur dioxide. The animation shows time-lapse satellite imagery of Kīlauea’s lava flow during the first few weeks of the eruption, captured by the European Space Agency’s (ESA) Copernicus Sentinel-2 satellite. Continuous satellite monitoring located hot spots, tracked lava flows, and tracked the changing coastline. 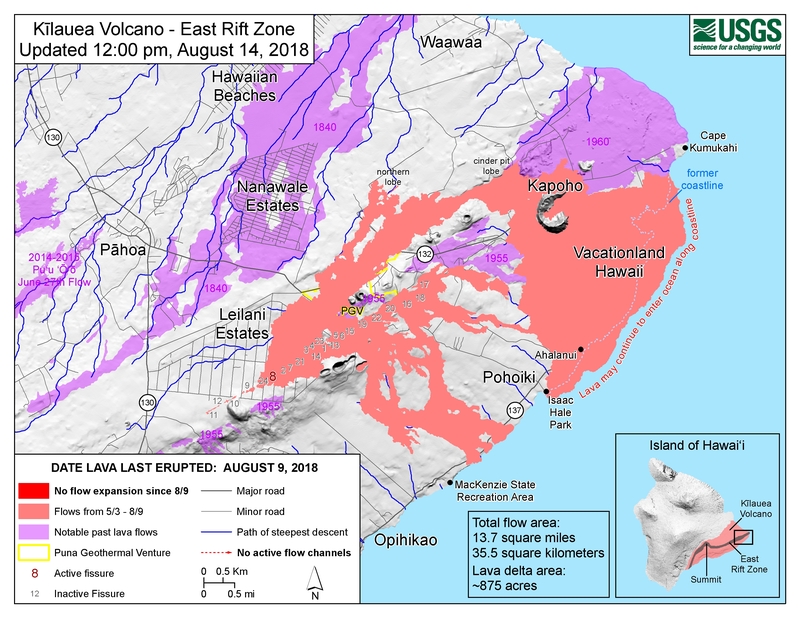 Active lava flows, which continued through 9 August, covered 35.5 square kilometers of existing ground and created about 3.5 square kilometers of new land along the coast. Although the eruption thankfully caused few casualties, more than 700 homes in the area were consumed by the lava flows. The end of California’s years-long drought did not grant residents a reprieve from their state’s annual wildfire season last year. Historically, the season has lasted from early summer to late autumn but is now considered to be year-round. Last year, more than 8,000 fires blazed across 1.8 million acres of California wildland. The fires cost around $1.79 billion in suppression efforts, destroyed more than 24,000 structures, and displaced around 250,000 people. The fires killed nearly 100 people, and many remain missing. Large fires like the Ferguson Fire, which raged for 37 days this past summer, can also create imposing and dangerous atmospheric phenomena like towering pillars of smoke. An astronaut aboard the International Space Station took this image of pyrocumulus clouds generated by the Ferguson Fire on 2 August. Pyrocumulus clouds form as hot air and smoke rise and then convect as they contact cooler air at high altitudes. The convection can push aerosols and particulate matter above the atmosphere’s lower boundary layer, allowing dispersal across thousands of kilometers. Side-by-side satellite images highlight the devastating effect that drought conditions had on Denmark’s agriculture last year. In the summer of 2017, Sentinel-2 captured the left-hand image of Slagelse, Denmark, and the surrounding land. Two thirds of the country, including this region, are agricultural lands that provide around 25% of Denmark’s exports. The right-hand image, also from Sentinel-2, shows the same region in 2018. Months of higher-than-average temperatures and lower-than-average rains, combined with tight water restrictions, desiccated farmland across northern and central Europe. In Denmark, average monthly temperatures from May to August 2018 were consistently 5°F–15°F hotter than the seasonal average, and rainfall was 15–20 millimeters below average. The Danish Agriculture and Food Council estimated that last year’s drought lowered crop output by 40%, cost more than $1 billion in lost revenue, and bankrupted more than 100 farms. Around 111,000 hectares of land surrounding the Chindwin River in northwestern Myanmar flooded in 2015. Cyclone Komen and severe monsoon rains inundated Myanmar from July to September 2015, causing severe floods and landslides throughout much of the country. Myanmar’s Ministry of Social Welfare, Relief and Resettlement and the United Nations Office for the Coordination of Humanitarian Affairs estimated that the floods displaced more than 1.6 million people, destroyed 21,000 homes and 840,000 acres of farmland, and killed 132 people. The image to the right, which combines radar data from two orbits of ESA’s Copernicus Sentinel-1 satellite, shows the extent of the flooding in Myanmar’s Sagaing Region. The underlying image is from 20 March 2015 before the river flooded. Scientists compared the baseline data to a second radar image taken on 4 September 2015 during the flood event to create the image to the right. Red highlights areas that experienced flooding after the summer monsoons, blue shows areas where groundwater saturation decreased, and white shows areas that experienced no change in groundwater saturation. On 22 December 2018, Indonesia’s Anak Krakatau volcano erupted and caused undersea landslides and a tsunami that struck surrounding coastal regions in the Sunda Strait. Anak Krakatau is a lava cone and caldera that emerged in 1927 after the eruption of Krakatoa. It had been growing steadily for decades and intermittently active since 1994. Disaster management agencies reported on 5 January that Anak’s eruption, collapse, and resulting tsunami caused 437 fatalities, injured 9,061 people, and damaged more than 613 homes. More than 16,000 people remain displaced, and more than 350,000 have been affected. This grading map provided by the European Union’s Emergency Management Service combines data from Sentinel-2A and DigitalGlobe’s WorldView-2 to show the dramatic changes to the island’s coastline. Contours show Anak’s boundaries before the event (blue, 16 November), a week after (yellow, 29 December), and 3 weeks after (red, 11 January). The red hatched region shows the caldera’s area, and the black hatched region shows the accumulated lava as of 11 January. The bright orange off the southwestern coast is sediment released into the sea by the landslides. Satellites continue to monitor the area and provide information on Arak Krakatau’s shifting landscape. Citation: Cartier, K. M. S. (2019), Earth’s devastating power, seen by satellite, Eos, 100, https://doi.org/10.1029/2019EO114485. Published on 25 January 2019.